Little, Brown Books for Young Readers, 9780316247825, 368pp. The powerful story of one girl's triumphant journey, inspired by true tales of life in Sudan -- now in paperback. Life in Amira's peaceful Sudanese village is shattered when Janjaweed attackers arrive, unleashing unspeakable horrors. After losing nearly everything, Amira needs to find the strength to make the long journey on foot to safety at a refugee camp. 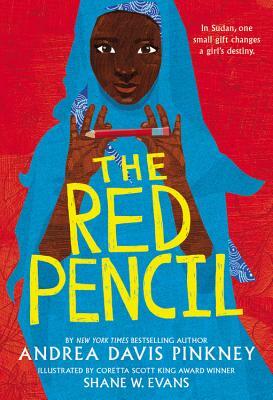 She begins to lose hope, until the gift of a simple red pencil opens her mind -- and all kinds of possibilities. Andrea Davis Pinkney is the bestselling and award-winning author of many books for children, including Bird in a Box, Sit -In, Hand in Hand, and Martin & Mahalia. Shane W. Evans is the illustrator of many books for young readers, including the Coretta Scott King award winner Underground: Finding the Light to Freedom. * "Pinkney faces war's horrors head on, yet also conveys a sense of hope and promise." * "Amira's thoughts and drawings are vividly brought to life through Pinkney's lyrical verse and Evans's lucid line illustrations, which infuse the narrative with emotional intensity.... An essential purchase."